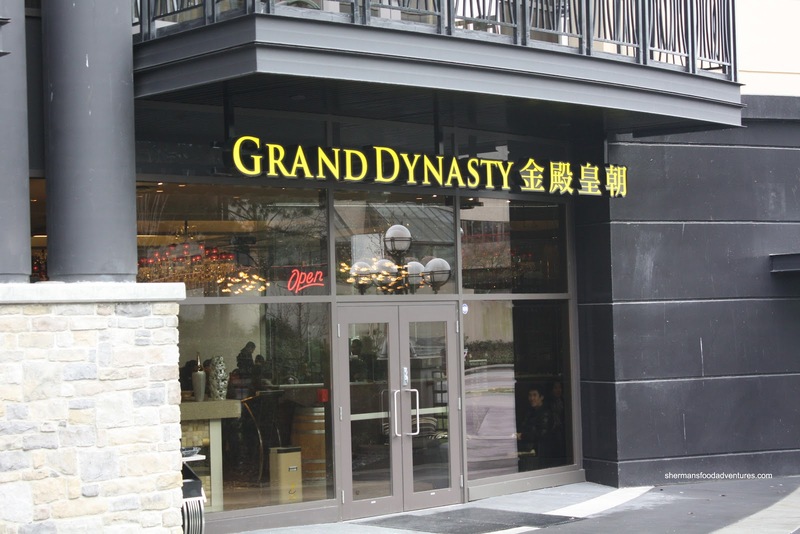 From the moment that Grand Dynasty opened its doors in late 2010, I've enjoyed their generally good food and nicely appointed dining room. 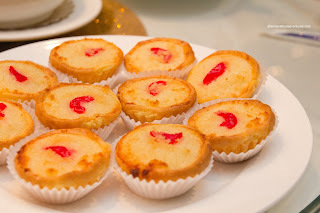 In fact, I was there for Dim Sum during their opening week and even then, I was impressed with the food quality and service. 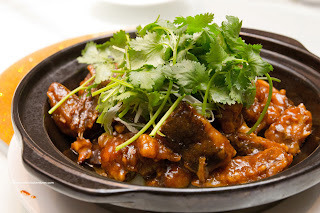 I returned on Chinese New Year to try out their dinner service and it was equally as good. Now all of this didn't come without a cost, literally. The place is pretty expensive, yet there is no immediate competition nearby. I guess by virtue of being located in the Villa Casinos complex, there will be a steady stream of customers (those who won money or those drowning their sorrows). 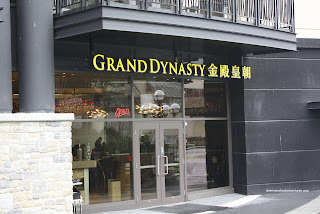 The last time I visited the place was part of the CRA signature dish tour and honestly, it was less than impressive. Maybe my expectations for the place were too high? Well, I returned once again for some signature dishes, with ChineseBites this time around. Joining me were the usual crew of Rick, Janice, Kevin, Grace, Diana and Queenie with Ann and Dave. 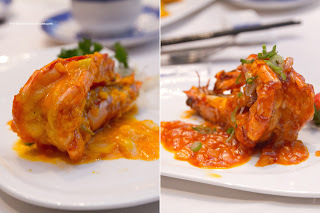 We started with 2 versions of their Pan Fried Jumbo Prawns. The first was the Salted Duck Egg Yolk and the second was the House Spicy Sauce. Reminiscent of the golden crab at Ken's, the salted egg yolk sauce was quite mild while still exhibiting a creamy understated saltiness. Interrupting the smooth sauce were bits of onion and garlic. The prawn itself was meaty and naturally sweet. As for the house spicy sauce, it appeared to be mainly sweet chili sauce with the addition of more garlic. It was sweet with a slight kick. Next up was the Boiled Live Lobster in Superior Broth. 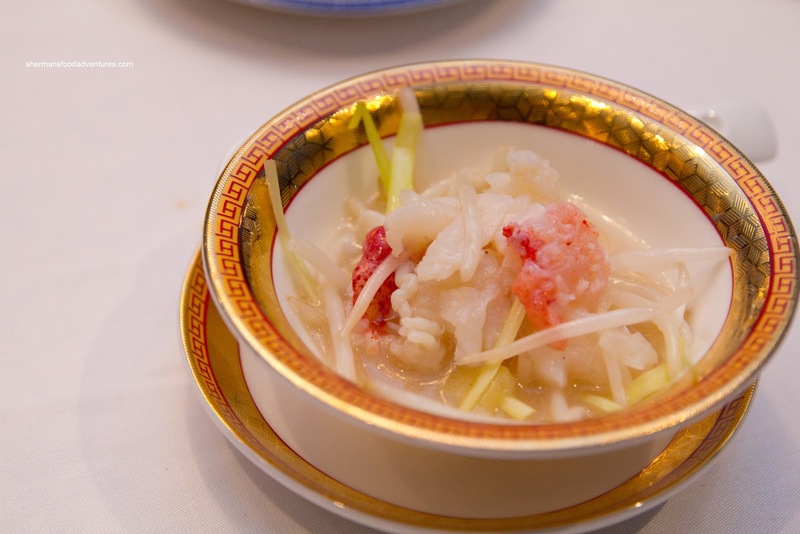 The sliced lobster meat was presented on a platter which included blanched flowering chives and bean sprouts. The broth was heated in a hot pot atop a portable gas burner. It was subsequently ladled onto the lobster, hence cooking it (ever so gently). Naturally, the fresh, barely-cooked lobster was sweet and exhibited a beautiful bounce texture (except for the claw meat). The broth was mild with a good hint of ginger. For such an exquisite offering, I felt that there should have been more "lobster" flavour though. The Baked Chicken Stuffed with Sea Cucumber was a dish that came completely out of left field. First, we thought it was roasted duck. Second, we expected it to be stuffed with sticky rice. Nope. 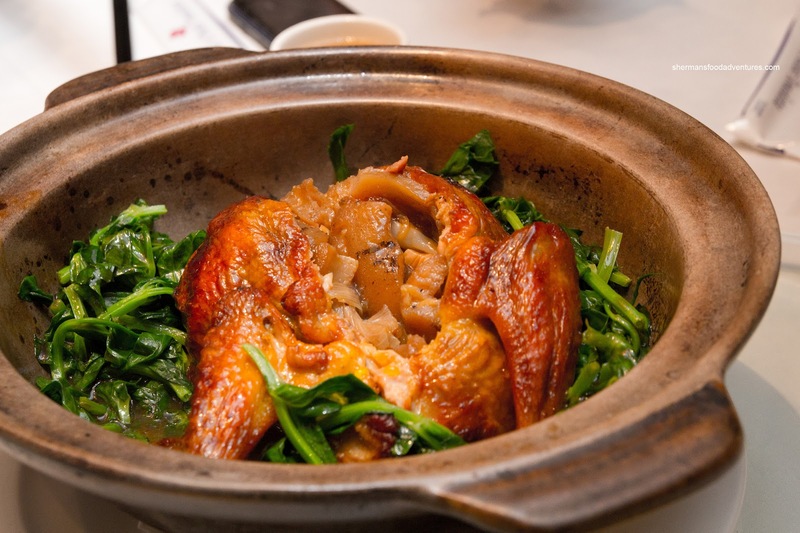 It was indeed a roasted chicken with sea cucumber segments and snow pea tips. The chicken itself was moist and benefited from a good brine. It had a rich roasted flavour which was evident from the beautiful exterior colour. The sweet onions helped balance the overall flavours. As for the sea cucumber, it was prepared properly being soft and gelatinous. The dish as a whole was nice, yet seemed to be missing something. 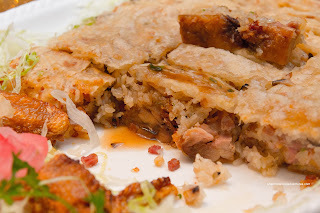 I personally would've liked something added to the filling such as roasted pork for some impact (sea cucumber is not really an impactful stuffing). 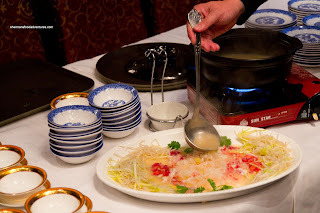 After those unique dishes, we were presented with something more familiar in the Live Jumbo Ling Cod Hot Pot. Essentially a glorified "Banh Nam Bo", this was definitely better than the ones you'd find on a regular Chinese menu. I loved the rich colour and resulting flavours. There was just enough sauce that had a good balance of salty and sweetness with a hint of dried orange peel, lots of roasted garlic, shiitake mushrooms, roasted pork and ginger. The cod itself was indeed jumbo and really meaty. It was fried up beautifully where it was moist on the inside while a touch crisp on the outside. 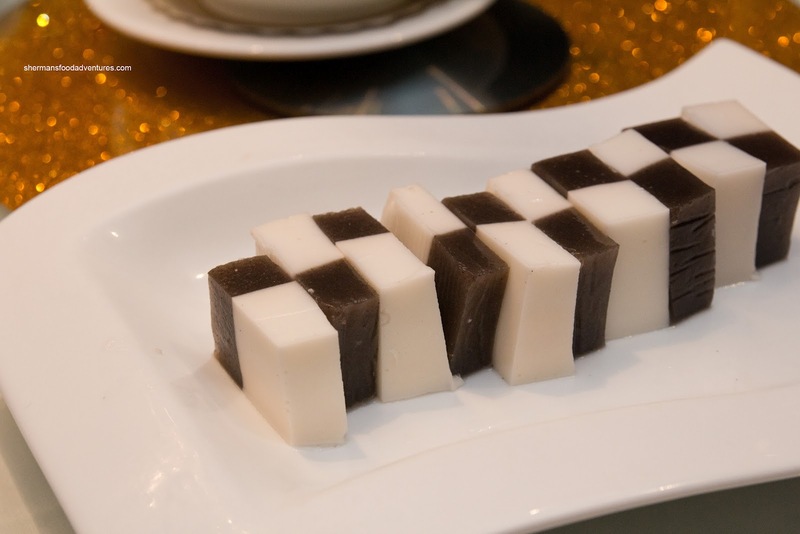 Naturally, with most multi-course Chinese meals, there would be a vegetarian offering. The Sauteed Wintermelon and Pumpkin with Wild Mushrooms filled that quota. 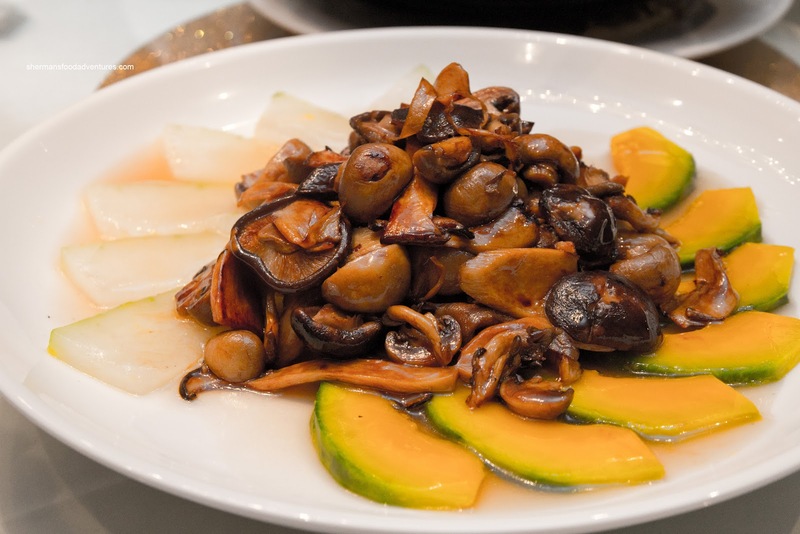 A mix of shiitake, button and oyster mushrooms lay atop fanned out slices of wintermelon and pumpkin. For me, the pumpkin was more like golden squash (which was quite hard and undercooked). The mushrooms benefited from good wok heat which added both good caramelization in flavour and appearance. The entire dish could've used less salt though. We finally got our sticky rice (which we thought would be in the baked chicken) in the form of Deep Fried Chicken with Sticky Rice. I wasn't a huge fan of this dish as the rice was hard and dry (with dried shrimp and Chinese Sausage). The accompanying sauce with shiitake and garlic didn't do much to alleviate the dryness either. The rice crust on the top was fairly crisp though. As for the chicken, it was surprisingly moist and had hint of 5-spice. 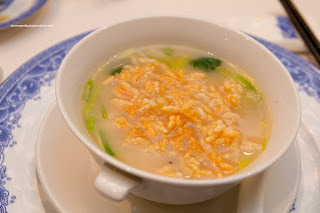 We ended the savoury portion with the Live Lobster & Seafood with Crispy Rice in Soup. The broth had a relatively more pronounced seafood/lobster flavour than our first soup. It mild, yet sweet and the seafood was just cooked. The crispy rice added a nice crunch to the soup (yah, crunch in a soup...). 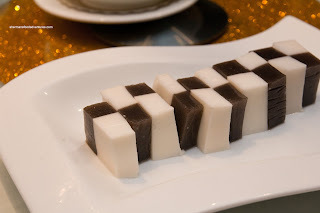 Finally, for dessert, we were presented with the Shredded Coconut Creamy Tart and Black Sesame and Coconut Pudding Cake. I found the tart to be rather crumbly and lacking in flavour while the pudding had a nice texture and aroma. Overall, a pretty solid meal that was lacking a bit in the "wow" department.